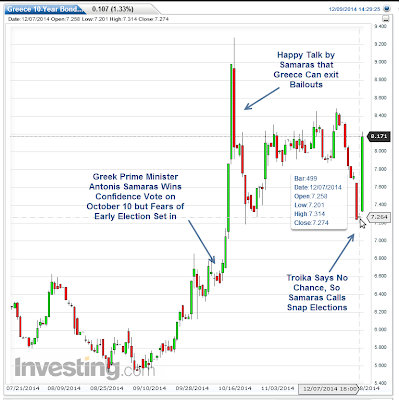 I commented on this on October 16, predicting snap elections: Greece 10-Year Bond Yield Soars to 9% as Prime Minister's Gambit Explodes; Snap Elections Likely, and Opposition Syriza Would Win. The hissy fit resumed today, following the actual snap elections announcement. That was the biggest one-day decline since December 1987. Balk shares led the way. Attica Bank lost over 26% and Piraeus Bank declined 17%. Greece’s political woes re-erupted as a threat to global financial stability yesterday, triggering the biggest drop on the Athens stock exchange since the 1980s and sending reverberations through world markets. 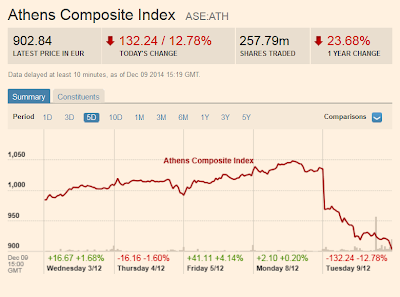 The trigger for the plunge was prime minister Antonis Samaras’ announcement of a snap presidential election. 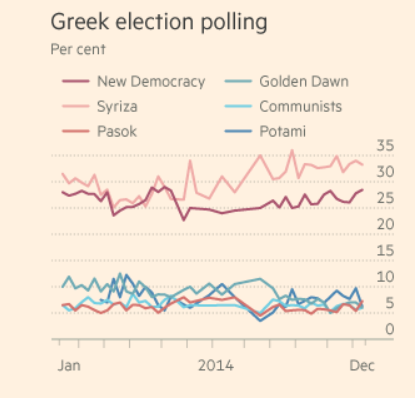 If he fails to win sufficient support for his candidate, an early general election could follow which investors fear will bring to power the radical left Syriza party. 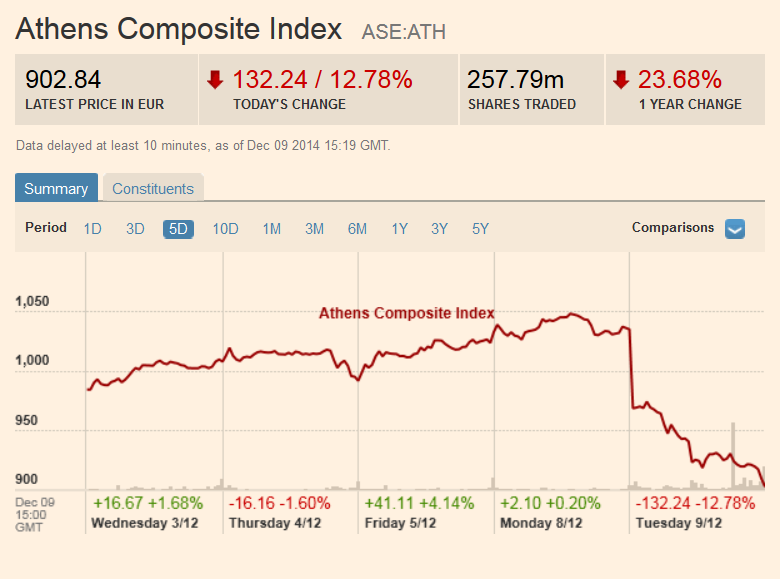 Such an outcome would reignite fears about Greece’s place within Europe’s monetary union. Syriza wants to renegotiate the country’s sovereign debt and hike public spending, moves which would put Athens at loggerheads with its creditors. By bringing forward the first round of the presidential election to December 17 — with further votes on December 23 and 29 — Mr Samaras appears to be gambling that independent MPs and those from smaller parties will back his candidate rather than face political and financial chaos triggered by a Syriza victory. He needs 180 votes, but the governing coalition only has 155. On Tuesday, yields on Greek bonds maturing in three year's time rose above 8 per cent, 25 basis points higher than equivalent 10 year yields, an indication that investors were growing increasingly concerned about the country’s ability to service its debts in the near future. 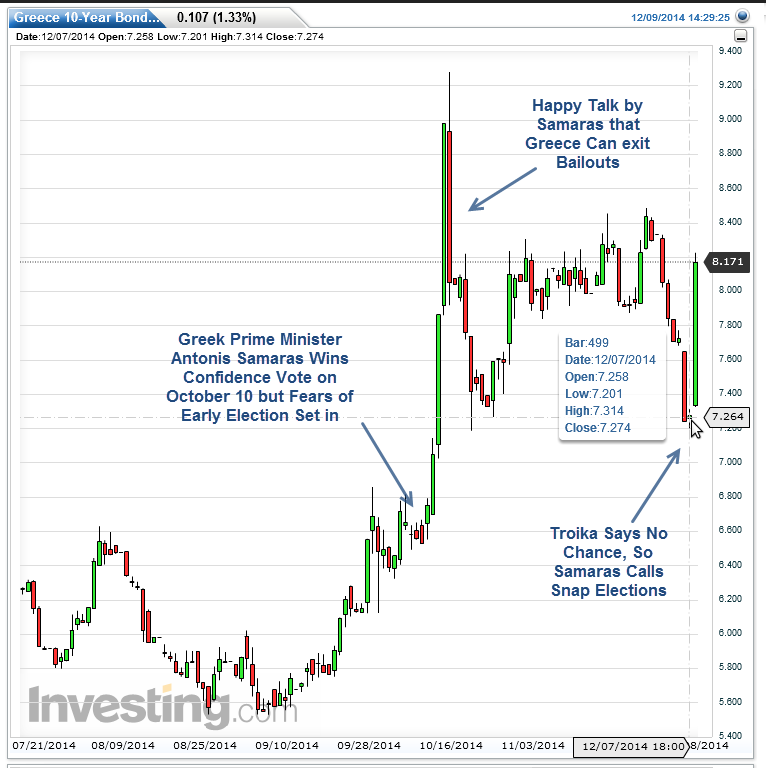 Will the stock market decline and surge in yields help or hurt Samaras? Certainly the political class in Greece, in Germany, in France, in the US and for that matter everywhere will be out in full force denouncing Syriza. Nonetheless, Samaras will fail on the first two presidential votes. It's the third vote that matters. In the past, the IMF, EU, and other outside influences swayed enough politicians to matter. It's by no means certain they can do so again. By the way, these aforementioned snap elections are to elect the president, a largely ceremonial post. The Greek constitution mandates dissolution of Parliament and a national election should the Greek parliament fail to appoint a president. Syriza holds a substantial lead in national elections. If it appears the final vote for president is headed the wrong way, watch German Chancellor Angela Merkel come out with some wishy-washy praise for Samaras including some small offer of debt relief or other favors. If threats and praise do not work but the vote is close, there's always money under the table to buy a few needed votes. Should bribes fail, expect the stock and bond markets to react with even greater volatility ahead of the next national election because Syriza party leader, Alexis Tsipras, threatens to renegotiate Greek debt.